The High School Boys kicked off their Winter League season over the weekend and 4 of our teams were in action. All 4 teams played 2 games over the weekend, and the games were buzzing with a ton of highlights! 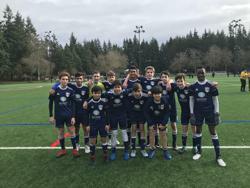 3 of our teams are competing in the top division and after a great PACNW Winter Classic showing last weekend, the boys were excited to get back on the pitch to compete. The weather on Sunday made the games quite interesting for all teams involved, but nonetheless, it was a great experience for everyone. Our B03 White team competed in two matches over the weekend against some great opponents. The team struggled to come out on top, but the boys played with a ton of passion. In the first game against Guereros, the boys combined for an excellent goal from forward Wanzi and was assisted from fellow striker Fischer. In the second game, the boys played hard in the sideways winds and rain. The boys weathered the storm quite literally, but going up against the wind, they scored a world class team goal with several short passes and worked themselves all the way up the field. The goal was scored by birthday boy Fischer and assisted by Ian. The boys will look to improve on defensive shape and offensive spacing heading into next week’s training. Our B03 Navy team played well over the weekend after getting two decent results. The boys faced off with Lake Washington to start off the weekend. The boys took the lead early with a great goal from Yadata midway through the first half. Lake Washington equalized in the second half, but the Titans quickly retook the lead with a great goal from Alex Cho. After the boys took the lead, they never looked back to seal off the 2-1 victory. The B03s then went on to compete against the Issaquah Gunners away. Mother nature put both teams at a disadvantage with the winds and the sideways rain. The boys were down 1-0, but thanks to another outstanding 25 yard strike from Alex Cho, the B03 Navy team were able to come away with tie against a good team. They will look to improve in training this week as they gear up for the February 3rd and 4th weekend. The B01 Navy team had another great weekend as they came away with a big 4-0 win in their first matchup against Eclipse FC. Coach Javi and the boys have been working very hard in training focusing on patience in the attack and switching the field of play. The boys executed the game plan to near perfection as Sam, Slone, Jorge, and Charlie all got on the scoresheet. In their second matchup of the weekend, the boys played a hard fought match against Edmonds FC. The boys put away an excellent team goal, finished by Kyle Pohle, and standout player James Miller had a beautiful free kick in the top corner. The game finished up 2-2 as weather was a big factor in the game like most of the games on Sunday this weekend. The G02 Navy team also competed over the weekend against FPSC Fury at Robinswood Park. Offensively, the girls played great as they scored two excellent goals, one from Caven Baumeister and the other from Avery Carlson. However, the girls were unlucky to concede a couple late goals and ultimately fell short at the final whistle. The girls will look to bounce back in training this week as they have their next game February 3rd against MRFC. That rounds up our weekend review! Stay tuned every weekend as we will look to recap all of the weekend's action and results. GO TITANS!! !